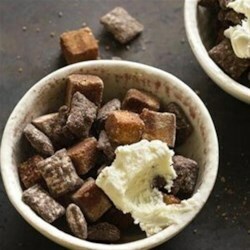 "Chocolatey tiramisu flavors in an easy to make Chex® party mix." In large bowl, place cereal. In small microwavable bowl, microwave butter uncovered on High about 30 seconds or until melted. Stir in espresso; add chocolate chips. Microwave on High 30 seconds; stir. Continue microwaving and stirring until mixture is smooth. Pour chocolate mixture over cereal; toss until well coated. In large resealable food-storage plastic bag, mix powdered sugar and cocoa. Add cereal mixture and pound cake pieces; shake until evenly coated. Serve in individual bowls or glasses. Top with dollops of mascarpone cheese. Cream cheese and savory goodies roll up in tortillas for easy appetizer bites. It was amazing. And I didnt add the cake pieces or the cheese and my mom and I lloved it so much!!!!! This is my family's favorite. So easy to make and so tasty!